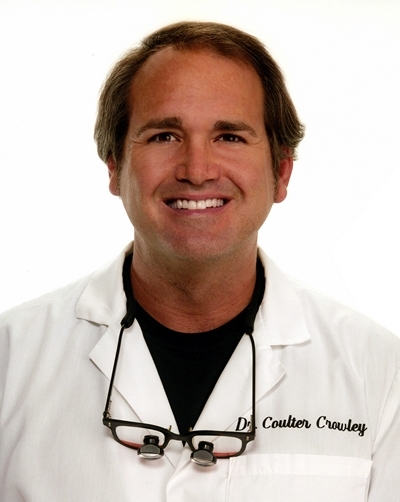 Dr. Crowley received his Doctorate of Dental Surgery from the University of California Los Angeles (UCLA) in 1991. After graduation, he joined the staff of Century City Hospital, Century City, California, and began practicing General dentistry with an emphasis on Cosmetic dentistry in the private office of Dr. Bill Dorfman, DDS, famous for 'ABC's Extreme Makeover' and 'CBS's The Doctors'. He also served as primary clinical consultant for Discus Dental, Inc., Beverly Hills, known for their product ZOOM Whitening. After moving to Rancho Mirage in 1999, Dr. Crowley began practicing as an Independent Contract Dentist in Riverside and San Bernardino Counties. In 2007, he was selected by his peers as one of the 'Top Doctors' as reported in Palm Springs Life, California's Prestige Magazine. In 2011, he became an associate of Board Certified Prosthodontist, Dr. Craig Conrow, DDS, who affords a state-of-the-art dental facility in Palm Desert, California. Dr. Crowley excels in all areas of General dentistry, including cosmetic veneers, tooth whitening, crown and bridge, oral surgery and root canal therapy. He places primary emphasis on a healthy, beautiful smile for his patients, giving them confidence in their appearance while maintaining the function and health of their teeth. He offers his patients a comfortable dental experience with sedation dentistry. Dr. Crowley stays current with the latest techniques in dentistry through continuing education (CE) courses including advanced training in cosmetic and holistic dentistry. He is a member in good standing of the California Dental Association, the American Dental Association, the American Academy of Cosmetic Dentistry, the Holistic Dental Association, the International Association of Mercury-Safe Dentists, the Tri-County Dental Society and past member of the Hollywood Dental Society.